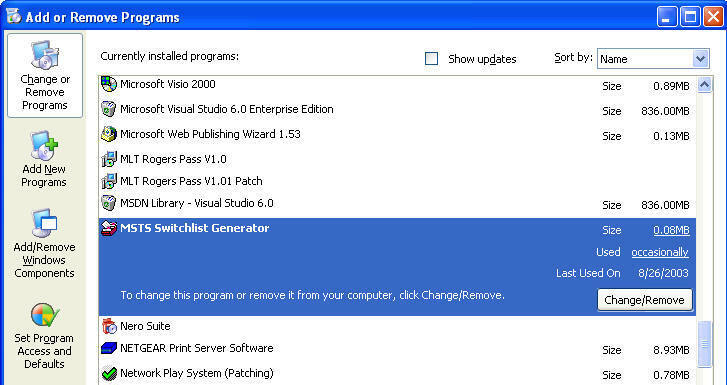 Upgrading from SwitchList Generator (all versions) to Activity Generator (which includes SwitchList Generator Classic). Follow the instructions below to install. You MUST already have some version of SwitchList Generator installed to apply this update! DO NOT PROCEED if you don't have your original password for SwitchList Generator. Instead, please e-mail your PayPal receipt to Update Password Needed. When asked "Are you sure you want to completely remove MSTS Switchlist Generator and all of its components" click on "Yes". First unzip the file you downloaded. You will need your original install password to unzip this file. Inside that file will be an install program, "setup.exe". Double-click it to run it. This will guide you through the install process. This ALSO includes the latest version of Version 1, 1.0.6, now called "SwitchList Generator Classic".